Much of our research revolves around cities. Buildings, infrastructure, resources, transportation, commerce, development policies, design, and people's preferences and behavior (to name just a few factors) all play a critical role in how well cities function. Instead of studying any one of these factors in isolation from the others, we endeavor to study several factors at once as well as their interactions with each other. We call our approach "Infrastructure Ecology," because cities, taken with all of the elements, interactions, and emergent properties, tend to resemble ecological systems. Not all of our research falls directly into the infrastructure ecology category. We also work in the areas of water treatment, engineering education, and air quality. Below is a list of research projects undertaken by BBISS researchers. EAGER: SSDIM: Superimposed Simulations: Fast Generation of Synthetic Data of Interdependent Critical Infrastructures, PI: John C. Crittenden, Co-PI: Richard Fujimoto, Funding Source: National Science Foundation; Award Dates: August 2017 – September 2019; Award Amount (including supplements): $180,000. 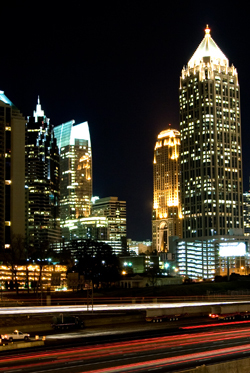 New algorithms will be developed and applied to create data sets for test cases that include the interaction of water, energy, transportation infrastructures and people in the city of Atlanta. These algorithms will provide insights into how to evaluate threats and opportunities within and across interdependent critical infrastructures, to analyze strengths and weaknesses, and to design solutions, products, and services that meet societal needs and goals. - Supplement: 8/25/2018 – 9/1/2019, $30,000 for an Graduate Student Industrial Internship at Arcadis. Participatory Modeling of Complex Urban Infrastructure Systems (Model Urban SysTems), PI: John C. Crittenden; Co-PI’s: Baabak Ashuri, Bert Bras, Jennifer J. Clark, Richard M. Fujimoto, Nancey Green Leigh, Subhrajit Guhathakurta, Tom McDermott, Valerie Thomas, Marc J. Weissburg; Funding Source: National Science Foundation; Resilient Interdependent Infrastructure Processes and Systems (RIPS) - Type 2; Award Date: 9/1/2014 - 8/31/2017; Award Amount: $2,999,946. This three year project is designed to develop the theory that infrastructure systems, with their many interdependencies and complex adaptations, have many similarities to ecological systems. The insights that arise from this grant will be useful in the future development of tools and methods used in the design and evaluation of urban infrastructure systems and their resilience under stresses like climate change, urban growth patterns, and extreme weather events. The investigators also expect that perspective will be gained by examining the relative advantages of ecological design versus engineering approaches in the design of complex systems such as urban infrastructure. - Supplement 1: 9/1/2016 - 8/31/2017, $200,000 to include Food, Energy, and Water Systems into scope of work. - Supplement 2: 9/1/2016 - 6/30/2017, $100,000 to host a workshop on the topic of Food, Energy, and Water Systems. - Supplement 3: 7/23/2018 - 8/31/2019, $150,000 to study real-world implementation of the proposed Principles of Infrastructure Ecology. Grant to Study Regional Industry, Economic Resilience and Energy Consumption, Co-PI: John C. Crittenden: PI: Juan Moreno-Cruz; Funding Source: National Science Foundation; Award Date: 9/2015 - 8/2018; Award Amount: $299,927. Current economic models that aim to understand how energy use and efficiency interact within a regional economy are geared towards a broad scale. They also don't account well for an unintended consequence that crops up when energy efficiency is in play, known as the "rebound effect." For example, energy use for lighting, as a percentage of total energy use, tends to increase as lighting technology becomes more efficient. This project will develop a model that introduces adjustments to comprehensively evaluate the economic impact of the rebound effect, as well as tailoring the model to a more regional scale. Understanding energy use and efficiency at a smaller scale will reveal how both energy efficiency and supply shocks effect a region's economic and energy resilience. U.S.-China: Systems-Based Approaches for Sustainable Steel Manufacturing, PI: Bert Bras; Co-PI’s: John C. Crittenden, Marc Weissburg; Funding Source: National Science Foundation; Award Date: 5/2015 - 5/2019; Award Amount (including supplement): $549,924. This project will focus on developing innovative systems-based solutions for increasing the environmental sustainability of the Chinese steel industry. China is by far the largest producer of crude steel, producing more than half of the global supply. Such enormous production levels are driven by both domestic and foreign demand. Steel production has significant environmental impacts, accounting for 6.7% of the total world CO2 emissions, and considerable use of, and toxic discharge to fresh water sources. In comparison, due to efficiency measures undertaken in the past 3 decades, U.S. metal production is two thirds less energy intensive compared to that of Chinese industries. The team will have cutting-edge access to the Chinese steel industry as well as eco-industrial parks, in which China is leading the world. The team expects that many unique insights will be gained. - Supplement: 9/1/2015 to 7/31/2019, $49,925. Characterization and Quantification of Solid Waste Disposed in Georgia, PI: Arka Pandit; Funding Source: Georgia Environmental Protection Division; Award Dates: 4/1/2015 – 9/30/2015; Award Amount: $31,004. This study will help the Georgia Environmental Protection Division (GA EPD) move beyond the typical waste management strategies toward a materials management philosophy that considers life-cycle considerations of products and services and focuses on resource conservation and recovery. It also will assist GA EPD in identifying the key performance indicators and facilitate identifying the best use of limited state resources to drive environmental improvement within Georgia’s economy. VIRTUES (Vertical Integration of Research, and Technical, Undergraduate, and graduate Education for Sustainability), PIs: Michael Chang, Mary Hallisey-Hunt; Funding Source: Ray C. Anderson Foundation. VIRTUES is a step toward developing a proactive process to incorporate the practice of sustainability throughout the workforce, not in the workplace as is occurring now at great cost to employers, but at earlier stages of educational experiences and workforce development when minds and practices are still forming. Forecasting Air Quality in Georgia, PI: Michael Chang; CoPIs: Talat Odman, Yongtao Hu. This program has been under way continuously since the summer of 1996. Investigators from Georgia Tech working with staff from the Georgia Environmental Protection Division provide daily air quality forecasts. In 2003, the program expanded to include forecasting for fine particulate matter. The program expanded again in 2006 when ozone forecasting for the Macon metropolitan area began, and again most recently in 2008 with the addition of forecasting of fine particulate matter for the Columbus metropolitan area. Detailed Criteria and Hazardous Air Pollutant Emission Inventories for the Ports of Savannah and the Savannah Metropolitan Area, PI: Michael E. Chang; Co-PIs: Talat Odman, Yongtao Hu; Funding Source: Georgia Ports Authority, Award Date: 4/1/2011 – 3/31/2012; Award Amount: $248,902. Development of a detailed spatial, temporal, and chemically speciated emission inventory for the Savannah Harbor, including all activities related to the Georgia Ports Authority’s Garden City and Ocean Terminals, and the other privately-owned terminals in the Port of Savannah. Larger air quality context of the Savannah metro area will be evaluated via contemporaneous inventories so that harbor emissions may be more readily and directly evaluated. Sustainable Infrastructure for Energy and Water Supply (SINEWS), PI: John Crittenden; Co-PIs: Charles Perrings, George Karady, Ke Li, Samuel Ariaratnam, and Eric Williams; Funding Source: National Science Foundation, Award Date: 8/1/2008 – 8/31/2016; Award Amount, including supplements: $2,324,821. SINEWS will develop a model architecture that integrates the water and power infrastructures which will include both their physical and socio-economic environments. We will evaluate the sustainability and resilience of water/power infrastructures under different growth, technological, and environmental scenarios. In particular, we will develop a suite of databases, model architectures and evaluation tools to examine three major attributes of the infrastructure. Rate Constants and Toxicity Estimation for the Computer Discovery of Byproducts Fate in Advanced Oxidation Systems, PI: John Crittenden; Funding Source: National Science Foundation; Award Date: 9/1/2009 – 9/1/2012; Award Amount: $399,010.